Paradoxically, rapid normalization of intracellular pH (pHi) following ischemia results in severe injury as a result of at least two mechanisms: rapid and complete opening of the (PT) pore and the generation of greatly increased quantities of free radicals (the “pH paradox”). Because the (PT) port cannot open under conditions of acidosis, acidosis is protective. Normalization of pHi before repletion of cellular ATP is associated with regional lysis of the capillary endothelial cells, leaving highly thrombogenic exposed basal lamina, and generating debris that contributes to non-thrombotic micro-vessel plugging. The pH paradox present a problem, in that in order to restore metabolic homeostasis and to achieve adequate hemodynamic recovery, it is necessary to at least partially correct the profound extracellular acidosis that develops after 10-30 minutes of GCI. One particularly attractive solution to this problem is to use drugs which function to block the Na++/H antiporter, also called the Na+–H+ exchange mechanism (NHE), a plasma membrane exchange glycoprotein transporter that functions in intracellular pH regulation, cell volume regulation. Figure 20: Cascade of signaling molecule activation involved in PMNL adhesion to the vascular endothelium. Figure 21: The Pathophysiology of Cerebral Ischemic Injury. 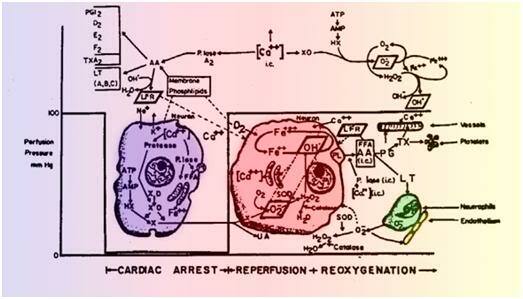 The above text and figure are reproduced with some changes from Safar, P., and Bircher, N.G., Cardiopulmonary Cerebral Resuscitation. 1988; W.B. Saunders Company, Ltd., London, UK. pp. 236-37. Schematic summary of the hypothesized mechanics of tissue injury in cerebral ischemia during both the circulatory arrest (left) and reperfusion (right) intervals. During normal conditions intracellular calcium (Ca++) levels are maintained at approximately 100 nM. Ca++ regulation is achieved by the plasma membrane Ca/Mg-ATPase and the ATP dependent uptake of Ca++ into the endoplasmic reticulum (ER) and mitochondria. The release of bound Ca++ from the ER store is believed to be triggered by inositol-1,4,5 triphosphate (IP3) and/or by free arachidonic acid (AA). Release of Ca++ bound in the mitochondria is not thought to occur until the ER stores are depleted. The initial response of many different cell types to stimulation–i.e., ligand-receptor interaction, hormone receptor binding, chemotactic peptide binding to polymorphonuclear leukocytes, or presynaptic or post-synaptic neurotransmitter binding , in an increase in Ca++ due to release of intracellular ER-bound Ca++, an influx of extracellular Ca++, or both. Changes in many intracellular enzyme activities, including phospholipases and protein kinases, the polymerization of g-actin to f-actin, and that of tubulin to microtubules, all occur at different “set points” of Ca++. Therefore much of the control of intracellular processes is related to the level of Ca++. During ischemia (left), in all cells (including neurons) the level of ATP decreases rapidly to near zero. This causes an increase in free calcium, even without an increase in IP3. The addition of 2-deoxyglucose to cells, which acts as an ATP sink, causes a rapid increase in Ca++. Increases in Ca++ activate phospholipase A2, which breaks down membrane phospholipids (PL) into free fatty acids (FFA), particularly AA. The AA causes increased activity of the cyclooxygenase pathway to produce prostaglandins (PG), including thromboxane (TX) A2, the lipoxygenase pathway to produce leukotrienes (LT), or both. Furthermore, during ischemia the hydrolysis of ATP via AMP leads to accumulation of hypoxanthine (HX). Increased Ca++ enhances the conversion of xanthine dehydrogenase (XD) to xanthine oxidase (XO), priming the neuron for the production of the oxygen free radical O2- intracellularly, once O2 is reintroduced. During reoxygenation (right), significantly increased levels of at least three free radical species (in oblique boxes) that result in direct and indirect damage to cell membranes and the extracellular matrix (and thus lead to edema and microcirculatory failure) may be formed: O2-, OH•, and free lipid radicals (FLR). O2- may be formed from two sources: 1) the previously described XO system and 2) activation of neutrophils in the microvasculature due to increased LT production by the neurons or simply by absent blood flow and consequent margination and diapedesis of neutrophils from the microvasculature. Increased O2- production leads to increased H2O2 production as a result of the intracellular action of SOD. H2O2 is controlled by intracellular catalase. Increased O2- production leads to increased OH•, due to the Fenton reaction (Fe++ +H2O2—>Fe+++.+OH+OH•) with iron liberated from ferritin, and the Haber-Weiss reaction (O2-+H2O2—>OH-+ OH•).. Each or all of these oxidants can result in lipid peroxidation and the production of LFRs. All free radicals can cause leaky membranes and currently irreversible cell damage. Furthermore, reoxygenation restores ATP via oxidative phosphorylation, which may result in massive uptake of Ca++ into mitochondria. Thus, increased Ca++ as a result of ischemia and reoxygenation, by itself, and by triggering free radical reactions, may well be the principal cause of neuronal necrosis during reperfusion. The direct destructive effects of HOCl-are probably limited in vivo by a variety of mechanisms.197 Most probably, the hypohalous acids act to inflict the lion’s share of injury by interacting with PMNL collagenase, elastase, gelatinase, and other proteinases. As is shown in Figure 1-22 it is now believed that the oxidants released from the neutrophil create a halo of oxidized alpha-1-proteinase inhibitor that allows released elastase (and probably others of the 20 or so known neutrophil-secreted proteolytic enzymes)198 to begin degrading the extracellular matrix, thus destroying capillary integrity and interfering with tissue metabolism and anabolism. Figure 22: Interactions between Neutrophil Elastase, α1- Proteinase Inhibitor (α1-PI), and Chlorinated Oxidants (green). 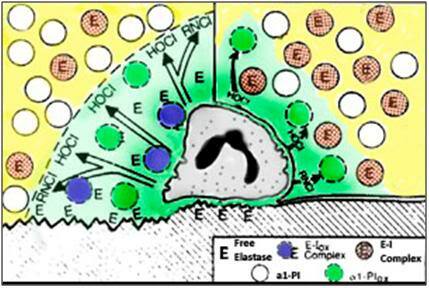 The left half of the cartoon shows neutrophil oxidants creating a zone of oxidized α1-proteinase inhibitor that allows released elastase to attack and degrade endothelial cells and adjoining tissue. Because α1-proteinase inhibitor can inhibit elastase only inefficiently, free enzyme may also be detected. The right half of the cartoon shows an alternative setting in which only a small portion of the α1-proteinase inhibitor is oxidized, thus ensuring the efficient regulation of the released elastase. In either setting proteolysis can occur to a limited degree subadjacent to the neutrophil. In the inset: E=elastase, I=Inhibitor and ox=oxidized. (Adapted from Weiss, SJ. The role of PMNL in mediating ischemic injury: Tissue destruction by neutrophils. N Engl J Med. 1989. 320: p. 365-76.). In RCIRI, it is clear that neutrophil activation with accompanying release of HOCl- and activation of elastase is a key factor in initiating the systemic cascade of the immune-inflammatory response which terminates in delayed multisystem organ failure (MSOF).199 The extent to which this pathway is a factor in acute global cerebral ischemic injury by causing acute injury and hypoperfusion immediately after the insult is not yet clear, but likely depends upon the adequacy of reperfusion and the quality of intensive care (since hyperpyrexia, episodes of hypotension, and inadequate post ROSC MAP all likely activate PMNLs). 173) Siesjo, B., Cell damage in the brain: a speculative synthesis. J Cereb Blood Flow Metab. 1981. 1: p. 155-85. 174) Rhenchrona, S., Effect of different degrees of ischemia and tissue lactic acidosis on the short-term recovery of neurophysiologic and metabolic variables. Exp Neurol. 1985. 87: p. 458-73. 175) Kalimo, H, Rehncrona, S, Soderfeldt, B., The role of lactic acidosis in the ischemic nerve cell injury. Acta Neuropathol Suppl. 1981. 7: p. 20-2. 176) Lowry, O., The stability of pyridine nucleotides. J Bio Chem, 1961. 236: p. 2756-59. 177) Siesjo, B., Influence of lipid peroxidation in vitro. J Cereb Blood Flow Metab. 1985. 5: p. 253-58. 178) Hartmann, M, Decking, UK., Blocking Na+-H+exchange by cariporide reduces Na_ overload in ischemia and is cardioprotective. J Mol Cell Cardiol. 1999. 31(11): p. 1985–95. 179) Kristian, T, Siesjö, BK., Calcium in ischemic cell death. Stroke. 1998. 29: p. 705–18. 180) Kristian, T, Kuroda, S, Siesjö, BK., Mechanisms of ischemic brain damage: the mitochondrial hypothesis revisited. In: Robertson JK, Nowak TS Jr., eds. Frontiers in CerebrovascularDisease: Mechanisms, Diagnosis and Treatment. Armonk, NY: Futura Publishing Company, Inc, 1997. p. 261–73. 181) Tymianski, M, Charlton, MP, Carlen, PL, Tator, CH., Source specificity of early calcium neurotoxicity in cultured embryonic spinal neurons. J Neurosci. 1993;13: p. 2085–104. 182) Murphy, M, Perlman, RE, London, C, Steenbergen, E., Amiloride delays the ischemia-induced rise in cytosolic free calcium.Circ. Res. 1991. 68: p. 1250-1258. 183) Karmazyn, M., Na+/H+ exchange inhibitors reverse lactate-induced depression in postischaemic ventricular recovery. Br. J. Pharmacol. (1993), 108. p. 50-56. 184) Moffat, MP, Karmazyn, M., Protective effects of the potent Na/H exchange inhibitor methylisobutyl amiloride against post-ischemic contractile dysfunction in rat and guinea-pig hearts. J Mol Cell Cardiol. 1993. 25(8): p. 959-71. 186) Valli, M., Influence of excitatory amino acids on the outcome of cerebral ischemia. Presse Med. 1987. 16(23): p. 1118-21. 187) Engler, R., Role of leukocytes in response to acute myocardial ischemia and reflow in dogs. Am J Physiol. 1986. 251: p. H314-322. 188) Engler, R., Consequences of activation and adenosine mediated inhibition of granulocytes during myocardial ischemia. Federation Proc. 1987. 46(2407-12). 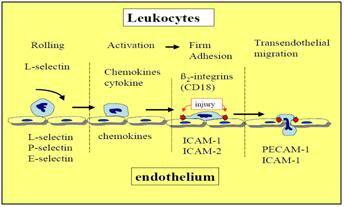 189) Beck, J., et al., Leukocyte-endothelium interactions in global cerebral ischemia. Acta Neurochir Suppl. 1997. 70: p. 53-5. 190) Engler, R., Consequences of activation and adenosine mediated inhibition of granulocytes during myocardial ischemia. Federation Proc. 1987. 46(2407-12). 191) Hartl, R., et al., Experimental antileukocyte interventions in cerebral ischemia. J Cereb Blood Flow Metab. 1996. 16(6): p. 1108-19. 192) Anderson, M., Experimental brain ischemia: Assessment of injury by magnetic resonance spectroscopy and histology. Neurol Res. 1990. 12: p. 195-204. 193) Halliwell, B., Oxygen Radicals and Tissue Injury: Proceedings of a BrookLodge Symposium. Augusta, MI 27-29 April, 1987. Federation of American Societies for Experimental Biology and Medicine, Bethesda, MD 1988, 1987: p. 1-143. 194) Klebanoff, S., Products of Oxygen Metabolism. In: Inflammation: Basic Principles and Clinical Correlates, eds. Gallin, IJ , Goldstein, IM and Snyderman, R, 1988. New York, Raven Press, 1988: p. 391-444. 195) Test, S.T., et al., Generation of nitrogen-chlorine oxidants by human phagocytes. J Clin Invest. 1984. 74(4): p. 1341-9. 196) Test, ST Weiss, SJ., Quantitative and temporal characterization of the extracellular H2O2 pool generated by human neutrophils. J Biol Chem. 1984. 259(1): p. 399-405. 197) Weiss, SJ., Tissue destruction by neutrophils [see comments]. N Engl J Med. 1989. 320(6): p. 365-76. 198) Henson, P., Phagocytic Cells: Degranulation and Secretion. In: Inflammation: Basic Principles and Clinical Correlates, eds. Gallin, IJ , Goldstein, IM and Snyderman, R. Vol. New York, Raven Press, 1988. 1988. 363-380. 199) Broner, CW, et al., Effect of scavengers of oxygen-derived free radicals on mortality in endotoxin-challenged mice. Crit Care Med, 1988. 16(9): p. 848-51.